Now that we've had a few days to analyze the first teaser trailer for Fantastic Beasts: The Crimes of Grindelwald, some fans have noticed something that could be a huge twist. The upcoming movie is the second installment in the Harry Potter prequel series, so the plot is drawn from the extensive mythology that J.K. Rowling has already established. Still, there are a lot of gray areas that we don't know anything about yet. But according to Entertainment Weekly, there might be a big reveal hiding in plain sight during one of the more mysterious scenes in the trailer. 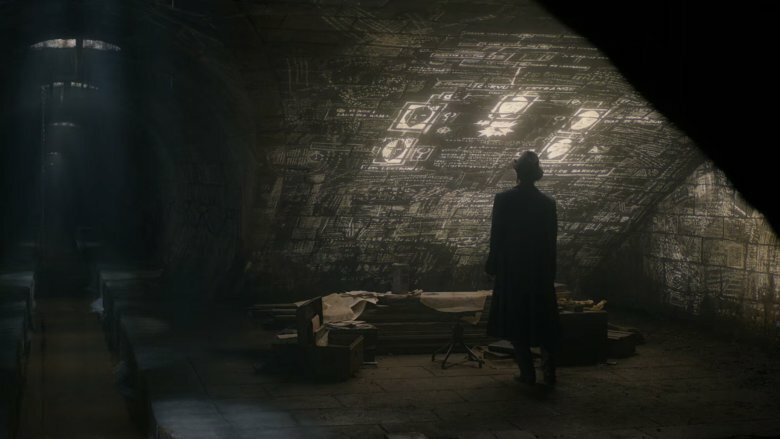 It's the brief clip of a figure who may or may not be Dumbledore (Jude Law) looking at what seems to be a magical projection on a wall in a sewer. It appears that it's the family tree for the Lestrange clan, a hugely significant family in Harry Potter lore. One of the family members seems to be Credence Barebone (Ezra Miller), the disturbed young wizard from America who was introduced in 2016's Fantastic Beasts and Where to Find Them. In the first movie, we learned that Credence was adopted and being raised by an anti-wizard named Mary Lou Barebone (Samantha Morton). But as he gradually discovered his powers under the grooming of Grindelwald (who was disguised as the auror Graves, played by Colin Farrell), Credence became more and more dangerous. However, we never knew anything about his biological family. So, as EW puts it, Credence could be the "anti-Harry Potter." He's an orphan who was raised by an abusive No-Maj family and believed he was normal until a powerful wizard helped him understand who he really is. He then travels to a distant location (probably Paris, since that's where we see him in the trailer) and finds that he has a destiny in the battle between good and evil. The Lestranges are an ancient wizarding family and one of the "Sacred Twenty-Eight," a name for the last remaining pure-blood families in the 1930s. They're related to the Black, Malfoy, and Lupin families, but they practice the Dark Arts and are committed to the idea of pure-blood supremacy. In the Harry Potter movies, we met Bellatrix Lestrange (Helena Bonham Carter), who married into the family. She holds a particularly notorious claim to fame as the killer of her own cousin Sirius Black (Gary Oldman). But the first Fantastic Beasts movie revealed that magizoologist Newt Scamander also has a connection to the Lestrange family. He used to be involved with Leta Lestrange (Zoe Kravitz), but he said that "people change." Of course, we also get a glimpse of Leta in the trailer, so it would seem the Lestranges could be a central part of the Fantastic Beasts series moving forward. We'll find out more when Fantastic Beasts: The Crimes of Grindelwald arrives in theaters on Nov. 16.